Namco Bandai Games And SD TEKKEN Bring TEKKEN 6 To Comic-Con! | SDTEKKEN.COM - TEKKEN News Resource! Namco Bandai Games And SD TEKKEN Bring TEKKEN 6 To Comic-Con! SD TEKKEN and NAMCO BANDAI Games are teaming up to bring the TEKKEN 6 experience to Comic-Con in San Diego! Tekken fans and fighting gamers of all ages are welcome to join in on our 8th annual series of Tekken tournaments taking place from July 23 – 26! Don’t miss out on the prizes, giveaways and the chance to play the console versions of TEKKEN 6 before anyone else! Click below for the full press release! SANTA CLARA, Calif., (July 10, 2009) – It’s time to throw down the gauntlet as NAMCO BANDAI Games America Inc. and leading Tekken fan site, SD TEKKEN, today announced that they will host four days of TEKKEN® 6 tournaments at Comic-Con International in San Diego, California. The tournaments will be held on July 23 – 26 in Room 17B at the San Diego Convention Center. This exhibition is an opportunity for all players to check out the console versions of TEKKEN 6 prior to its much anticipated North American release on October 27, 2009. At the end of each day, the tournament winners from that day will then be invited to compete for a daily grand prize. “With this being our eighth year running Tekken tournaments at Comic-Con, SD TEKKEN is proud to give gamers a chance to enjoy a game that is near and dear to our gaming hearts. Gamers will experience the latest edition of one of the most revered fighting game series in history. We are excited and honored to be working alongside NAMCO BANDAI Games to bring attendees a series of tournaments that will blow their minds! This is a great opportunity for gamers to get a first hand experience with the console version of TEKKEN 6, enjoy watching high level tournament play and experiencing one of the most action packed 3D fighters ever made,” said Mark Julio, SD TEKKEN Director and Founder. Spanning over a 14 year legacy, Tekken is among the most popular and well-known gaming brands in the world with the entire franchise selling more than 32 million units to date. Displayed in astonishing HD detail, a new era begins this fall in the sixth King of Iron Fist Tournament complete with intense gameplay modes as well as new features and environments. A must-have for Tekken aficionados, TEKKEN 6 for the Xbox 360® video game and entertainment system from Microsoft and PLAYSTATION®3 computer entertainment system, sees the return of many familiar faces as well as new characters to create the largest line-up the series has ever seen. With robust character customization, online gameplay and a new action Scenario Campaign mode, TEKKEN 6 will be the best “King of Iron Fist Tournament” yet. Delivering the perfect fighting trifecta, TEKKEN 6 will also be available for the PSP® (PlayStation®Portable) system this fall. Optimized for the PSP system, TEKKEN 6 will not only contain the explosive action of its home console brethren but also feature additional stages, content, items, and an ad-hoc multiplayer mode. 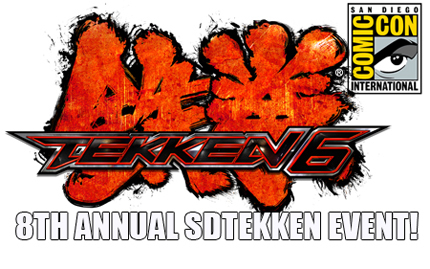 For more information about SD TEKKEN and the tournaments, please visit: www.sdtekken.com. “PlayStation”, “PLAYSTATION”, “PS” Family logo and “PSP” are registered trademarks of Sony Computer Entertainment Inc. Memory Stick Duo™ may be required (sold separately). Xbox, Xbox 360, and Xbox Live are either registered trademarks or trademarks of Microsoft Corporation in the United States and/or other countries. This entry was posted on Friday, July 10th, 2009 at 3:14 PM and is filed under Comic-Con, Namco Bandai Games Inc., PlayStation 3, PSP, San Diego, SD TEKKEN, TEKKEN 6, TEKKEN.COM, Tournament, USA, Xbox 360. You can follow any responses to this entry through the RSS 2.0 feed. You can leave a response, or trackback from your own site. 45 Responses to Namco Bandai Games And SD TEKKEN Bring TEKKEN 6 To Comic-Con! It is still a chance to play the game before it comes out. Let’s not be nitpicky! If I wanted to, I could bring up how people were able to play it at Editor’s Day and E3 before EVO/Devastation/Japan Expo etc… lol. Awesome! Nate, so this must be the surprise announcement that you were talking about. I’ll be up there on Saturday and Sunday. Lol, it will probably be called Tekken 7: JR, then Tekken 8: KR, Tekken 9: HR! Very nice Mark, I am suprised Namco hasn’t hired you as a “Events Advisor” or “Community Manager”. I’ll be there Friday and Saturday, wish I could have gotten in on Thursday. Is SDT running the event? Thus not eligible? I do find it kinda shocking Namco isn’t having the tournaments on the main convention floor, but rather in some room on the second floor? Take away some of the heat from Tatsuckage Vs Capcom. SDT and Namco will be working together to run the tournaments. NB’s floor space isn’t as large as Capcom’s. So they’ll be redirecting Tekken addicts upstairs. Wish NB had gotten a bigger space in the exibitor hall. Yeah, Tekken addicts will show, but I am sure they want to reach out to a broader audience. Hmm, I wonder; they could have the finalists play in their booth? Just a thought. this will be a good opportunity for you to check out whther the PS3 version still has slow-downs or have they fixed it. Why Capcom gotta have larger floor space than Namco? I’ve seen footage of Tat. VS Cap., looks dumb and like it was made for children. Damn sure not better than Tekken. Yo Markman send me a copy for PS3 too. lol! Well SDT is getting the recognition it deserves at last! Great job mr. Julio. Tekken SD has gotten this far very impressive. Simple website but very nice and very resourcfl. But to be honest up until now i really dont know whats the meaning of “SD” and i have been visiting this website for quite a long time now. stupidity is not very rewarding aint it? Does playstation consoles has any restrictions for gores and violence compared to P.C? Hey MarkMan, any word of a demo being released for XBL and PSN? I mean, Marvel had a demo and T6 has been out for quite some time. If NAMCO will make a tekken movie it should be CG like the game intro or something like that. Holy crap guys, that’s amazing! I wish such cooperation with Namco was better in other countries, it really looks so nice that Namco participates in such events! So, since this is a console tournament, do we bring our own controllers? Or will they be provided? just out of interest, how long as sdtekken been going on for ? SD TEKKEN has been around since 2000. We didnt’ establish a website until 2003. In 2006 we decided to make it more of a community site. Well congratulations, this is quite an incredible achievement. I admit I haven’t been giving you as much as credit as you should have been getting in the past, but I admit I was wrong. Sweet, I get to lay my hands on Tekken6 at con!! Just one thing, with so much Tekken will there be room for smash bros brawl this year? I missed last years brawl tourney. Yeah Brawl is a bad competitive game (bring on smash bros melee bebeh!) but it’s still a fun game that atracts a good crowd to participate. Darren Henson who plays Raven has some pics and a clip of some choreography with Lateef Crowder who plays Eddy Gordo. Only solid footage I can find.